Ōkuninushi (大国主) is a kami in Shinto. He is believed to be originally the ruler of Izumo Province, until he was replaced by Ninigi. In compensation, he was made ruler of the unseen world of spirits and magic. He is believed to be a god of nation-building, farming, business, and medicine. 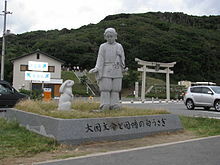 This famous tale of the Hare of Inaba is recorded in the Kojiki, but omitted in the Nihon Shoki. Ōkuninushi (at the time he was just Ōnamuji without the august suffix) and his brothers, eighty gods altogether, were all suitors seeking the hand of Princess Yakami/Yagami (八上比売) of Inaba in marriage. They were all travelling together from their home country of Izumo to the neighboring Inaba to court her. Along the way, the brothers encounter a poor little rabbit or hare, flayed and raw-skinned, lying in agony upon a sea shore. The group asks what happened, and the hare explains that he came from the island of Oki across the sea. He concocted a marvelous plan to accomplish this, recruiting the crocodiles (wani (鰐/和邇), interpreted as an imagined creature based on a shark) into his service, unbeknownst to them. He beckoned one crocodile, and challenged him to a contest to decide which of them had the greater number of kin, the rabbit or the croc-fish. To settle the bet, he told the crocodile-fish to line up in a straight row across the strait, so he can hop on and count the numbers. But before the hare had completely gotten ashore to safety, he gloated about having tricked them, the last crocodile in line grabbed him and tore off the fur that clothed him. The gods who listened on were cruel-hearted, and as a prank, instructed the hare to wash himself in the briny sea, and blow himself dry in the wind. The hare was of course in much more stinging pain than was before. Then came along Ōkuninushi lagging far behind. The gentle-hearted god told the hare to go to the mouth (of the river) and wash himself in the fresh water, then gather the flowering spikes of cattail plants growing all around, and scatter the catkins on the ground and tumble around until he is covered by fleece. The cured rabbit makes a divined prediction that Ōnamuji will be the one to win Princess Yakami, "Though thou bearest the bag." (Evidently his brother was treating him as a luggage carrier, and that was why he was outpaced by the rest of the group). Just as the rabbit predicted, Princess Yakami/Yagami pronounced before the eighty gods that she had chosen Ōkuninushi as her mate. The rival gods, his brothers, were all furious, and conspired to slay him. They compelled him, on pain of death, to chase down a red boar, which was really a boulder heated red hot. Ōnamuji died of burns, but his mother (Sashikuni-wakahime) petitioned Kami-Musubi [ja], one of the creator deities, and she dispatched two clam goddesses, Kisagai-hime and Umugi-hime [ja], to restore him. The passage regarding the curative treatment has been subject to emendations and reinterpretation. But recent commentary explains that the one goddess who represents the akagai or blood cockle gathered up her blood-red juices, which were placed in the shell of the other goddess who was a hamaguri clam. His rivals then tricked him into walking onto a fresh tree log split open and held apart by a wedge, and snapped it shut, killing him a second time. His mother revived him once again, and bid him to seek out Susanoo who has been banished to the Netherworld (Ne-no-kuni), and to obtain wise counsel. In the underworld, he met the storm god Susanoo and his daughter Suseri-hime, with whom he shortly fell in love. Of course, Susanoo was aghast. In response, he sent Ōkuninushi to sleep in a room full of snakes. However, Suseri-hime had given him a scarf, which protected him. When Susanoo sent him to sleep in a room with centipedes and wasps the next night, he was still successfully protected. As a trial, Susanoo shot an arrow into the middle of an enormous meadow, and told him to look for it. Ōkuninushi searched and eventually reached the middle of the field, at which point Susanoo proceeded to light the field on fire. A mouse showed Ōkuninushi a hole that he could hide in, and also brought the arrow to him. By now, after all his various attempts of murder, Susanoo was beginning to actually approve of Ōkuninushi. One night, after he told Ōkuninushi to wash his hair and go to sleep, Ōkuninushi tied Susanoo's hair to the rafters of his palace, and fled with Suseri-hime. He took Susanoo's bow and arrows and koto with him. When the couple made their escape, the koto brushed against a tree, awakening Susanoo. The god jumped up, and pulled down the palace with his hair. At the borders of the underworld, Susanoo almost caught up with the elopers and called out to them, advising Ōkuninushi to fight his brothers with Susanoo's weapons. Ōkuninushi asked him to make Suseri-hime his wife, and to build a palace at the foot of Mount Uka, which he agreed to. After the entire ordeal was over, Ōkuninushi became ruler of the province of Izumo. The Izumo-taisha is dedicated to his spirit and is one of the oldest and most important shrines in Japan. Ōkuninushi-no-kami (大国主神) – It means an emperor or monarch. According to another opinion, he is said to have been the king in Izumo. Ōnamuchi-no-kami (大穴牟遅神), Ōnamuchi-no-mikoto (大己貴命/大穴持命) – These were his names when he was young. Yachihoko-no-kami (八千矛神) – A hoko ("spear") is a symbol of power. For this reason, Yachihoko|"eight-thousand-spears"}} is believed a god of power. Ashihara-Shiko-no-Ō-no-kami (葦原色許男神) – A shiko-no-ō is a symbol of strength of men, that is, Ashihara-Shiko-no-Ō is believed a god of war. Daikoku-sama (大黒様) – Probably because of the similarity of this name with Daikoku-ten (one of the Seven Lucky Gods), the two gods became intertwined. ^ a b Chamberlain 1919, p.81-2 et seqq. ^ according to Nihon Shoki, contrary to Kojiki.